My daughter came home from school very excited today because she was recognized by the faculty as a Bucket Filler. “Be a Bucket Filler” has been the theme around which lots of school activities have centered this year. What is a Bucket Filler, you ask? It’s a pretty simple concept really. We all have invisible buckets that we carry around. When they are full we are happy and when they are empty we are sad. When we help others, show kindness, exhibit patience, and be nice, we fill other’s buckets. When we are mean, impatient, rude, or uncaring, we dip into their buckets. I was curious to learn where the concept of “bucket filling” and “bucket dipping” came from as it struck me as a good one for our philosophy of Thoughtful Leadership. Merrill Lundgren is known as The Bucket Man, and the person who brought the bucket filling concept to schools. Back in the 1970s Lundgren attended a presentation at his company where the speaker talked about bucket filling and bucket dipping. He was so moved by the idea that he quit his job and became a motivational speaker on quality of life. Years later he was asked to speak at a middle school and The Bucket Man was born. Today the Bucket Filler philosophy has spread to many schools across the country. What if bucket filling became the latest leadership competency, and conversations in the workplace turned to what we each are doing to fill our co-workers’, managers’, and customers’ buckets? How would that impact our experience at work and the level of employee engagement in organizations? A focus on others before we focus on ourselves is a premise that is found throughout current thinking on what constitutes strong leadership. Daniel Goleman’s work on emotional intelligence supports the idea that leaders who are able to self-manage and develop superior interpersonal skills are most successful. A similar concept is Stephen Covey’s Emotional Bank Account which illustrates the benefits of making deposits of positive actions in a relationship in order to build up against any withdrawals that come with negative behaviors toward another. You can read more about that here on our website. 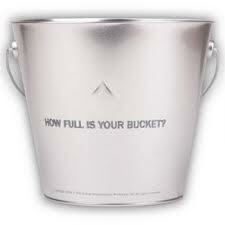 Commit to focusing more on being a bucket filler and on creating a culture of bucket filling within your workplace. What fills your bucket at work? What are ten things you can do tomorrow to fill someone else’s bucket? What about Bucket Fillers and author Carol McCloud? They’re the #1 group spreading the message of bucket filling in schools. Thank you for your comment. Carol McCloud’s book, Have You Filled a Bucket Today?, is a wonderful children’s book about happiness and a great testament to Merrill Lundgren’s work. Their work together is indeed spreading the message in schools across the country. Thank you for your comment, Jeffrey. Yes, Dr. Donald O. Clifton was the first to use the bucket and dipper metaphor as it relates to leadership.